When we work for ourselves and service so many others, it’s important to take some time out for you. Follow these tips to create the perfect space to retreat to – if only for a short while. Cold days are a great reason to spoil yourself. Even the heartiest outdoor enthusiast will want to warm up with these interior ideas – think chalet, think spa, think sacred space…Pick a spot in your home where you can indulge in a little retreat. To plan this space let’s consider how you would like to use it, decide what elements in that space will allow it to provide that function and then put it in place. When you have the space prepared you’ll realize how valuable it is. In this instance a space in a den, a corner of a living room or a section of a bedroom is perfect to create a comfortable retreat. Some of the furniture options to consider: chair and ottoman; chaise lounge; oversized chair to curl up in or a sofa. A side table or coffee table – not too large you don’t want to clutter this area up too much. Lighting- if this is an area you might be able to use in the daytime try to set up near a window. Whether or not you are near a window a good reading lamp (table or floor) is a must. lighting tip – the lamp height should be just above and slightly behind your shoulder so that it lights up the pages in a book or magazine properly, the interior of the shade should be white so that it does not cast an odd light. 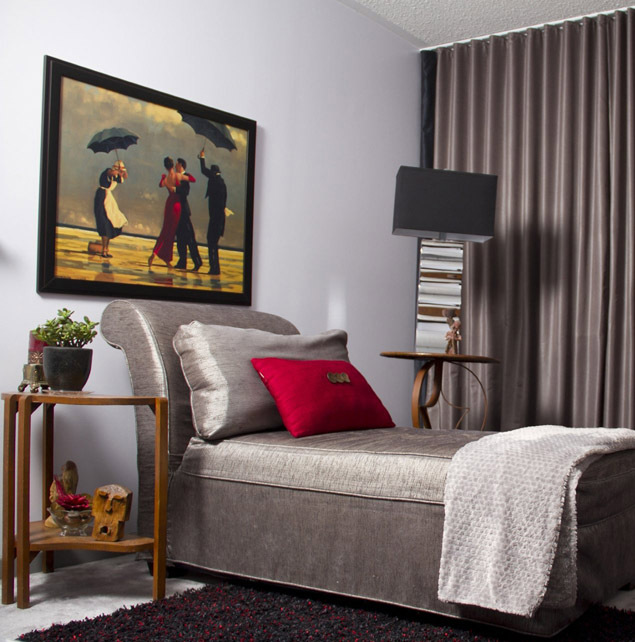 Work with warm fabrics in this space – if you have a linen chaise add a chenille throw and a couple of faux fur toss cushions, perhaps a small carpet beside the chair. Accessorize this space in a very personal fashion – on the table a favourite vase, a sculpture, maybe candles. Bring a plant in – it’s always a good idea to surround yourself with nature. Put a favourite piece of art on the wall (no wall? use an easel to add a unique dimension and presentation to the room). Include a little storage in this space for books, magazines, crafts or pencils – this could be part of the side table or an ottoman with storage or for that matter a nice magazine container. Indulge yourself, so that you can service your clients better. Karen Klucowicz is the lead designer with Erotica Interiors Inc. – a full service design studio that helps bring peoples’ passions alive through interior design – creating sensual private or commercial spaces.